Junior Duck Stamp Contest Winner Revealed! 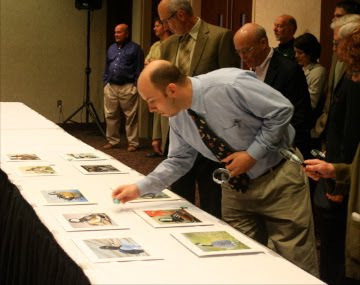 I had the pleasure of attending the 2010 Junior Duck Stamp Competition finals today. Here's a round-up. The event was held at the Science Museum of Minnesota. This was only the second time in the history of the competition that it was held outside of Washington D.C. There were approximately 200 people in attendance. All of the works being judged today were by kids who had won their respective state competitions so as they pointed out many times. Everyone who had their work in this part of the competition was already a winner. When the event began, all 53 of the final works of art were laid out on long tables. The judges and the public were welcome to take a close look. In the first round of judging, the judges could each place a poker chip on five different pieces. If any one judge voted for the piece it went on to round two. 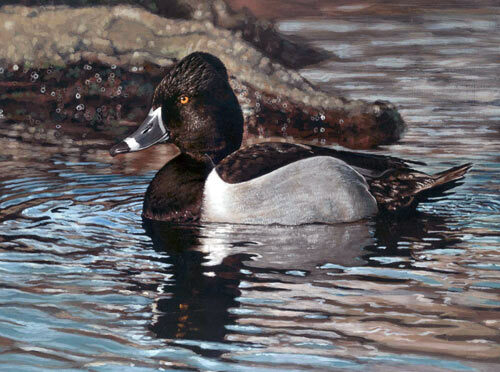 Below is a nice painting of a Ring-necked Duck painted by Christine Swanson from West Lynn, Oregon. You can see one of the judges has placed a chip on it so it made it to the next round. With five judges each placing five chips, the end of the first round brought the total down to 25 still in the running. For the second round, the judges could each place two chips which cut the finalists down to just 10 paintings. For the third round, each judge could only place one chip which would mean only five would progress to the final round. Here the judges are inspecting the ten works and trying to decide which five should advance. One thing to notice is that they all have what appears to be magnifying glasses in their hands. This is not the case. The hand lenses they have to not magnify the image, they shrink it. Some of the painting the kids did were simply stunning paintings but they may not have been the best choice for a duck stamp. Let's look at an example. I mentioned in my earlier post that I love this painting by Jiwon Shin from New Jersey. The work itself is magnificent and if I had to strictly grade the quality of the work in a regular painting contest I would say it just edges out Christine's painting shown above. However, look at what happens when you shrink the images to the size of the duck stamp. Suddenly they look very different. When they are the size of the actual stamp, it doesn't matter how detailed the one on the right is, the bird has become hard to see against the busy background. The simpler background in the first one makes the bird much more striking. This is why the judges use the shrinking hand lenses. They need to see what the image will look like as a tiny stamp. This is no ordinary art contest. Forgetting that the image will be small was probably the biggest mistake that took paintings out of the running. The forth round was based on scores. The five works were paraded past the judges one by one. They then had to give it a score, 1-5. After all five were scored, the one with the highest points won. Here's the judges scoring the piece that eventually won. Those numbers total up to 23 which was just one more point than the second place finisher. 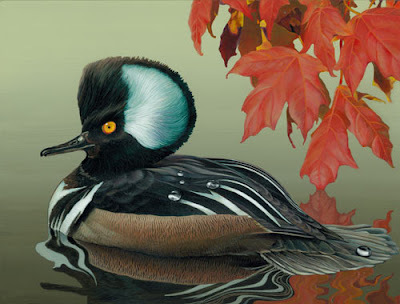 This wonderful painting of a male Hooded Merganser by Rui Huang from Ohio. This painting got the highest score. Four of the five judges gave it a 5 while one judge gave it a 3. After the event I had an opportunity to talk to the judge who gave it a 3 to find out why his score differed and it shows an interesting insight into how judges look at the work. He really liked the winning entry but he pointed out that while the painting is wonderful it had what he considered a sort-of natural history issue. The Hooded Merganser pictured is shown in beautiful breeding plumage. Breeding plumage appears in the spring but the leaves shown along with the bird are clearly autumn leaves. From an educational standpoint he felt that detracted some from the image and he preferred the second place image that showed both the male and female hooded merganser. Word to the wise, these are the kind of details judges take into consideration. The event was fantastic and it was wonderful to see so many talented young artists from across the country. Be sure to buy your duck stamp even if (especially if) you are not a hunter. Funds from the duck stamp program raise about $25 million each year to fund wetland habitat acquisition for the National Wildlife Refuge System. Every stamp counts. Even if you only hunt these birds with a camera or binoculars, everyone should help out preserving the habitat that where they live.